UPDATE: The board of the Salinas Union High School District voted 5-1 for the Project Labor Agreement. Voting YES were Carlos Rubio, Patty Padilla-Salsberg, Phillip Tabera, Kathryn Ramirez, and Lila Cann. Voting NO was Evamarie Martinez. One seat is vacant. 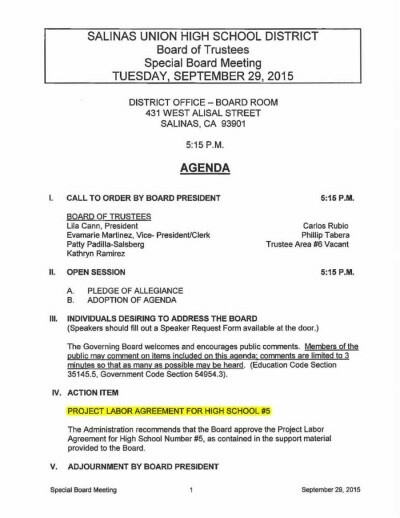 On September 22, the board of trustees for the Salinas Union High School District unexpectedly scheduled a special meeting at 5:15 pm on Tuesday, September 29 to vote on a union Project Labor Agreement. This contractual requirement applies to construction contractors, certain professional construction service firms that handle responsibilities such as soil testing, and even companies that deliver and install lockers and modular furniture. All companies will be required to sign the agreement and abide by its terms. Workers will be provided by the unions, benefits for employees will go to the unions, and workers will pay union dues and fees as a condition of work. This union agreement to be mandated by the school board seems unnecessary. Work funded by the 2002 bond measure was successfully completed by union and non-union contractors, and the school board did not interfere with or supersede its contractors’ internal labor relations. The Project Labor Agreement has the potential to discourage local non-union contractors from bidding, thus cutting bid competition and increasing costs to taxpayers. It may also encourage an influx of construction companies from the San Francisco Bay Area to travel to Salinas for this work.